Cleansers made with gentle, botanical ingredients, so beard care doesn't have to feel like roughing it. Whether you sport some stylish stubble or a full-on lumberjack face-warmer, it takes the right tools to keep your beard looking its best. Beard care starts in the shower, with regular washing—even a newly begun beard can benefit from a good scrub, clearing away dead skin cells and reducing irritation. But most shampoos aren't formulated to be so close to your nose or mouth, with chemicals that can be downright unpleasant. This pair of cleansers is made with gentle, botanical ingredients with a mild lime and verbena scent, so that beard care doesn't have to feel like roughing it. 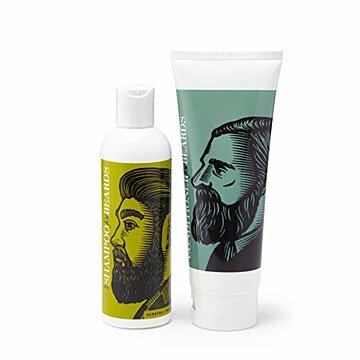 The shampoo gets rid of oils and dirt from the hair, while the conditioner helps reduce tangles for grooming, and leaves the beard soft and strokable. Together they're a one-two punch to help you or the man in your life maintain a knockout look. Made in California. Apply a small amount, massage well, and rinse thoroughly.